What is QUADRO made of? QUADRO is primarily made from polypropylene (PP), as well as high-density polyethylene (HDPE), both of which are plastics considered safe for food packaging and containers. Polypropylene (PP) and high-density polyethylene (HDPE) are identified with the recycling codes 5 and 2 respectively. Polypropylene is one of the most neutral plastics, containing only two elements: carbon and hydrogen. Both plastics are considered a safer, non-toxic and environmentally friendly alternative to other plastics. QUADRO is very safe. It is free of PVC, BPA, PAHs, phthalates and lead. QUADRO components exceed the European safety requirements for toys (EN 71). What temperatures can QUADRO withstand? The plastics QUADRO is made from are also used in food packaging, making the components resilient within a temperature range of 14 – 104 ºF (-10 – 40 ºC). Note: Low temperatures can quickly lead to water on panels freezing, creating a danger of slipping. Are newer QUADRO components compatible with older sets? Yes! All QUADRO components are compatible with each other, all the way back to the original from 1979. If you have found or inherited older components, we recommend inspecting them for cracks, fading or any other damage before building with them. A good test is to construct a cube using 35 cm tubes and a panel, and put it under a load of 100 kg. A slight bending of the panel is normal, and it should reshape after the weight is removed. We also recommend cleaning the older components before combining them with new ones, as sand and dirt can make connections more difficult. If you are looking for inspiration, visit the QUADRO Model Database. Additionally, you can create your own designs in 3D using our QUADRO Design Program (Windows). Click here to download. What is the maximum weight QUADRO can support? That depends on the design. 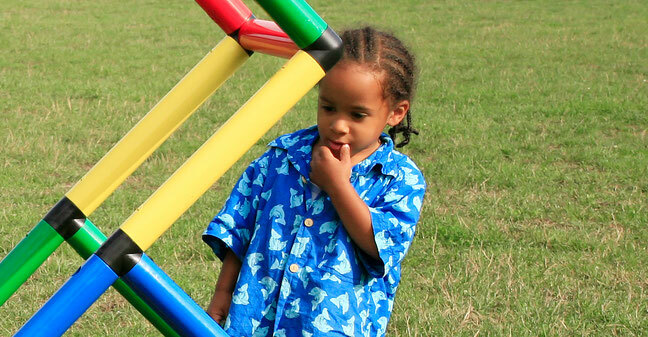 A cube constructed with 35 cm tubes and a panel can support a 100 kg adult without the panel breaking or being damaged. The panel will bend slightly and regain its shape when it is no long under load. 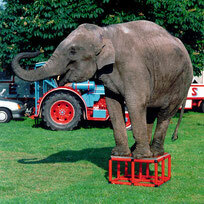 However, a 2x2 QUADRO frame reinforced with a Plexiglas top can withstand a 5-ton African elephant. Is there a maximum age for using QUADRO? No. General QUADRO usage is without age restriction. If a particular design no longer suits a grown child, it can be adapted to a more fitting use — for example, as a piece of furniture. Where can I download instruction manuals? You can find instruction manuals as well as other information about kits and designs by visiting the QUADRO Model Database. Does QUADRO fade in the sun? QUADRO is treated with an ultraviolet (UV) stabilizer for protection against the sun and its effects on color. However, nothing can resist the sun’s power indefinitely. Over enough time QUADRO will slowly begin to lose its shine. We have customers who have kept original sets from the 80s outdoors for over 15 years. The components were still red, but dull rather than shiny. Can I use QUADRO in chlorine or salt water? Yes. QUADRO is made from polypropylene (PP) and high-density polyethylene (HDPE), which are resistant to salt, acids and bases, grease and detergents. Of course, exposing QUADRO to chlorine or salt water means its shine will fade earlier than usual. Where can I download a design’s QDF file? QDF files are available for download at the QUADRO Model Database. There you can find more information about kits and designs. A QUADRO Design File (QDF) contains a 3D model of a QUADRO construction. It is fully editable using our QUADRO Design Program (Windows). Click here to download. It is also possible to create your own designs from scratch and save the QDF for later reference or editing. Your imagination is the limit. Have fun designing! How can I easily plan my own designs? The QUADRO Design Program (Windows) was specially developed for that purpose. It is a 3D editor for creating and customizing your own designs. Click here to download. The program opens “QDF” files. Download a design’s QDF file from the QUADRO Model Database to quickly get started customizing. Can I build furniture with QUADRO? Yes, of course! QUADRO is a construction system using pipes, connectors and panels, making it perfect for building anything. Why am I having difficulty taking apart my model? Take the model apart around midday when the outdoor temperature is peaking. If after the above steps certain components remain difficult to disassemble, use a mild liquid lubricant from a spray bottle to reduce the friction between components. Give them a little shake and turn to distribute the lubricant. Be sure to use a key that gets good torque on the screw. Next, remove all screws from the model. Only then begin to remove the pipes from the connectors. Once the model is completely disassembled, give all components a thorough cleaning to remove any dirt/sand, moss/grass, etc. Damaged components should be replaced with new ones. You can purchase individual QUADRO components here. The age of your kit does not matter as original components from 1979 are still compatible with today’s. How do I completely empty the pool? The drainage valve on QUADRO pools cannot be positioned any lower without reducing the quality of the product. To remove the water beneath the valve, go to the opposite end of the pool and lightly lift up on it to continue draining the water. The water level will sink low enough that it is safe for you to flip the pool over. Why does the pool have a slimy film? It is called biofilm. The longer water stands, the more time naturally occurring bacteria have to live and grow, forming a slimy substance on surfaces. We recommend changing the water daily (maximum 2 days). Since this is a children’s pool, we advise against using additives. Clean the pool with normal household cleaners. How can I reduce the buildup of static electricity? An important factor to consider concerning electrostatic charge is the level of air moisture. The drier the air is, the higher the electrostatic charge. An air moisture of 40% normally should be sufficient to minimize the risk of electrostatic charge. The air moisture must be measured and can be adjusted with a humidifier. In addition to the air moisture, if the floor has insulating properties, such as laminate, rubber soles moved across it will lead to an electrostatic charge. Using wet towels under the construction can help. However, it will not immediately have an effect. Why is attaching the run-out to the slide so difficult? Attaching these slide parts is not the same as general tube and connector assembly; this is a 2-person job. The parts need to be aligned carefully in order for the screw to turn easily. You may need to use a thick flathead screwdriver for greater torque. Why do I see white breaks in a component? This is called “stress whitening” and is a normal side effect of the plastics used by QUADRO (polypropylene (PP) and high-density polyethylene (HDPE)). Over-stressing a component can cause discoloration. This is unavoidable. However, this is only cosmetic damage — the component is still structurally sound and can remain in use. Note: Our 6-year guarantee covers damaged or broken components and not cosmetic wear. Are a kit’s component colors evenly divided? No. This is not possible as not every kit comes with an even number of components. What happened to the Double Tube? The QUADRO Double Tube was replaced with the Double Tube Connector. This component connects two standard tubes. The advantages over the previous Double Tube are improved stability and greater flexibility with other components. Are QUADRO components washing machine friendly? Sure! But do not use a water temperature over 40 ºC (warm, not hot).